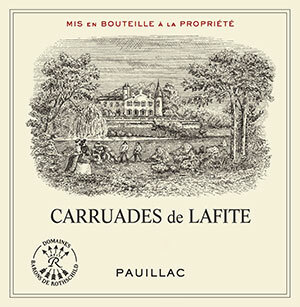 A classic example of a second wine, the 2005 Carruades de Lafite reveals a dark ruby hue with some pink showing at the rim. The moderately intense nose of graphite, forest floor, and sweet black currant fruit is followed by a medium-bodied, elegant wine with light to moderate tannin. Drink it over the next 10-15 years. Has coffee and chocolate aromas, with hints of ripe fruit. Medium-bodied, with soft tannins and a fruity, plummy, milk chocolaty aftertaste. The second wine of Lafite Rothschild. Best after 2012.